Hiram Crespo writes for HumanistLife about the philosophy of Epicureanism, and argues that is has made a resurgence in modern works of positive psychology. 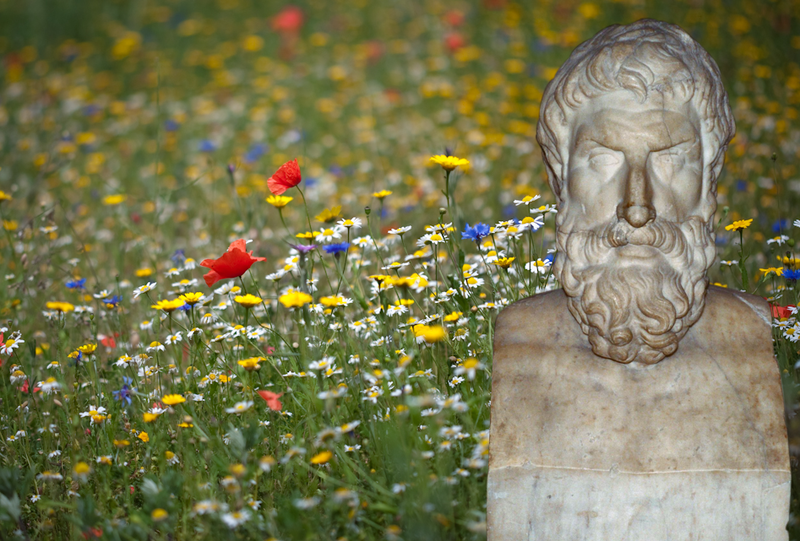 Stumbling upon happiness in the garden of Epicurus? Flowers: Tim Daniels. As the annals of history have it, in the sixth century Emperor Justinian had all the schools of philosophy that competed with Christianity finally closed. This was the last we heard of the Epicurean School, whose tradition had remained culturally vibrant for seven centuries. Epicurus had been among the first to propose the atom—2,300 years ago—the social contract as a foundation for the rule of law, and the possibility of an empirical process of pursuit of happiness: a science of happiness. These progressive schools were oases of tranquility, reason and pleasure known as Gardens, where the ideals of civilized friendship flourished and men, women and even slaves engaged in philosophical discourse as equals. In his Principal Doctrines 11-12, Epicurus argued for the study of science as a way to emancipate ourselves from irrational fears. For naturalists who don’t believe in gods or spirits, the first two negative statements may be translated as ‘Do not fear chance or blind luck, for it is pointless to battle that which we have no control over. It generates unnecessary suffering’. Roman Epicurean poet Lucretius, in his De Rerum Natura, dedicates long portions of the philosophical poem to explaining how natural phenomena such as lightning and the movements of heavenly bodies are not the work of the Gods and that fear of the Gods is inconsistent with civilized life. Since he was unable in those days to produce a fully scientific theory to explain all these phenomena, he provided several possible theories for many of them without officially endorsing one, and humbly acknowledged that future thinkers would prove the main points of his naturalist and scientific cosmology, which they eventually did. And so we can say that his basic attitude was a sound one, and also that he respected our intelligence enough to not exhibit arrogance and certainty where he did not have conclusive theories. He allowed time to prove him right … and sincere. That the prohibition against fearing the Gods, and against fear-based religion in general, is the first and main taboo in Epicurean philosophy, remains refreshing to this day. There is also the symmetry argument, which compares the time after our death to the time before our birth of which we have no memory. Since there is nothing there, why fear it? It is as unintelligent to be needlessly tormented about the afterlife as it is to be tormented about the state prior to birth. I frequently argue that it wasn’t just the teachings, but the manner in which they were imparted –within the context of a loving community of philosopher friends– that served as a consolation and that it is impossible to replicate the peace and conviction that Epicurus gave humanity without this sense of community. The latter two positive statements in the Tetrapharmakon lead to Epicurean teachings on how we should evaluate our desires and discern which ones are unnecessary versus which ones are necessary, which ones carry pain when satisfied or ignored versus which ones don’t. By this analytic process, one learns to be content with the simple pleasures in life, those easiest to attain and which carry little to no pain. It is here that the real fruits of Epicurean insight begin to be reaped. The best things in life are free. One of the first psychological tasks of every Epicurean is to become mindful of his/her desires and whatever pain or anxiety they may be generating. Another task is to learn to relish and appreciate the simple things when they’re in front of us. The good friends, the good foods and the refreshing beverages, the family, the good music, our proximity to nature, even our view of the sky which (as Carl Sagan advised us) should always humble us. The good news, according to Epicurus, is that happiness is easily attained if we cultivate philosophy. He cites the need for thankfulness and for robust friendships as fundamental ingredients for the good life, and not only categorizes desires but also discerns between kinetic (active) pleasures that happen when we satisfy a desire, and katastemic (inert) pleasures that happen when we have no desires to satisfy, which he labeled as superior. Harvard psychologist and happiness researcher Dan Gilbert confirms Epicurus’ insights, including how meaningful relations significantly increase the amount of pleasure and of memorable experiences that we gather throughout our lifetime. He uses different verbiage: natural happiness is that attained when we satisfy a desire (kinetic pleasure, in Epicurean parlance) whereas synthetic happiness is that which we enjoy regardless of attaining desires (katastemic pleasure). Because synthetic happiness requires no externals, it is therefore superior, it is a sign of a liberated being. He argues the case for synthetic happiness by citing the example of the lottery winner and the paraplegic who exhibit similar levels of happiness one year after winning the lottery and losing the lower limbs, respectively. These cases had been studied by happiness researchers Brickman et al. This, in positive psychology, is being called the hedonic treadmill or hedonic adaptation: the habitual happy state that we always return to. Methods are being researched to increase the heights that are normal for each individual. Gilbert’s theories, as far as I’m concerned, are Epicureanism by another name. One of the elements of Epicurean teaching that philosophers have struggled with the most throughout history is the idea of katastemic pleasure. It is often argued that lack of pain is not a definition of pleasure, but this is the art of happiness that Epicurus taught: that we must learn to be happy regardless of external factors and that it’s possible and desirable to cultivate katastemic pleasures via the philosophical disciplines. In fact, Epicurus argues that the very purpose of philosophy is to ensure an end to suffering and to create a beautiful, happy, pleasant life. Gilbert’s research upholds katastemic pleasure as a necessary ingredient in human happiness and is beginning to reinvigorate the discourse on the philosophy of happiness that Epicurus had begun, and which was interrupted by Justinian 1,500 years ago. He also adds new concepts to our science of happiness and even proposes that we have a psychological immune system that fights unhappy moods. Gilbert’s findings, along with research dealing with wellbeing in fields such as neuroscience and diet, point modern Epicureans in the direction of an interdisciplinary, practical reinvention of philosophy, which is just what we need if philosophy is to become once again the revolutionary, emancipatory cultural engine that it once was. As to the Fourth Remedy, Epicurus reminded us of the temporal nature of bodily pain. We may get a fever, or a stomach ache, but within days our immune system fights it. In the case of more chronic pains, one gets used to them after some time. In nature, no condition lasts forever. The impermanence of all conditions is a consolation when we consider whatever pain they generate. A dismissive attitude towards pain takes discipline but it can be cultivated if we are mindful, disciplined, and develop a resolve to protect our minds. Then there are mental pains and anxiety. These are systematically worked through via cognitive therapy. The resolution to follow Epicurus is a resolution to protect one’s mind. It’s impossible to be happy if we can’t control our anger and other strong emotions: we will go from one perturbed state to the next and never taste the stability of ataraxia, which translates as imperturbability and is the ultimate maturity that a philosopher can reach. We live in a dysfunctional consumerist society filled with anxiety and neuroses, where few people analyse their life, most have a short attention span and are usually uninterested in disciplining their minds and curbing mindless desires. If philosophy is understood as the Epicureans understand it, then it becomes evident that people desperately need philosophy today. Many more things could be said about the consolations of Epicurean philosophy. I leave my readers with an invitation to study Epicurus and engage themselves and others in philosophical discourse. I promise that your life will be enriched. This all hangs well with what you say about Epicurus; it is scientifically validated, and it promotes the simple life, and appreciating what is free. Anyone who is championing this stuff is OK by me, so thanks for writing the blog! You’re very welcome and I’m glad you enjoyed it! What a beautifully worded description. There are some aspects that remind me of what little I know about Buddhism – suffering is due to attachment, and letting go alleviates suffering. In some ways, I could have taken to these concepts more in a different time. Being later in life, and having cancer that could take me in 6 months, or 6 years, or not, no way to know – I still grieve somewhat, the loss of what I was hoping to experience in life. It’s not the fear of what happens when dead. I know that’s nothingness, as before birth. It’s that so much of life, I’ve tried to do the right thing, and sacrificed today for tomorrow, and invested time, and effort, and delayed enjoyment, for a future that may well not be there. Oh well. I try to live as best I can now, plant trees I might enjoy, but others, if they let the trees grow, will see them in their maturity. Which is how it should be. Daniel, I wish you well. It’s brave of you to post such an honest point of view. Whatever your past thoughts in life were, you are on the right track now. Don’t grieve for your past – you did the best you could, as we all try to. Enjoy what you can of the present, and know that your investment in the future will bring much joy, even to those who never knew you personally. Good to see Epicurus getting the attention he deserves! There is a marvellous book, The Swerve, by Stephen Greenblatt that I would recommend in this connection. It is subtitled “How the Renaissance Began” – not strictly accurately since it concerns events decades after Petrarch revived interest in and imitation of the poetry of the classical world. Instead it tells the story of the 15th century rediscovery of Lucretius’s De Rerum Natura that in splendid poetry set forth the philosophy and science of Epicurus and his followers. This exposition of how the world might be operating on naturalistic principles without divine intervention was a radical and highly dangerous idea, intolerable in a way that a revival of interest in ancient mythology could never be – and indeed when the work was disseminated it influenced and found echoes in Bruno, Galileo and others who paid a high price for it. The book tells the story of Poggio Bracciolini, a superb Latinist obsessed with style and famed for his legible and beautiful script. He was employed as one of his secretaries by Pope John XXIII – not the 20th century John XXIII but the 15th century one who stood out for his corruption in a papal system notorious for its self-confessed vice and venality, a subject of literary self-mockery by those involved. When John was deposed, fled, was captured and thrown into a dungeon in Constance in 1415, Poggio found himself out of a job and set out on a risky journey to visit distant monasteries famed for their libraries in search of parchments of classical texts, not then valued and often scraped clean for re-use for psalters or bible commentaries. In one such he came across the Lucretius, known at the time only as a title, and paid for it to be copied and sent to colleague in Rome. Poggio did not see it for another ten or more years, but then it began slowly to circulate in a samizdat manner and to work its subversive influence on the theocentric mindset of the times. The book not only tells this story, with colourful descriptions of 15th century life in Rome and in the benighted lands of northern Europe, but also takes in Epicurus and his time, Lucretius and the Epicureans of Herculaneum, a summary over several pages of the revolutionary ideas set out in the six books of Lucretius’s poem and the continuing influence of its naturalistic philosophy up to modern times, where we see it as an eminent precursor of Humanism. All this is delivered in the most readable manner, so that after finishing it I was strongly inclined to return to the start and read it again.